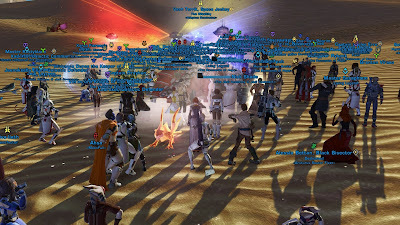 In case you've never heard of Swtorista - maybe because you're only playing SWTOR very casually; I can hardly fathom another reason - she is one of the game's biggest community contributors these days and recently got to celebrate hitting 20,000 subscribers on her YouTube channel (which has been sitting on my sidebar under "SWTOR Content on YouTube" for quite a while now). I have to admit that I haven't actually watched that many of her videos myself, because a lot of them are geared towards new players which means that I'm not really the target audience, but it's still great to see someone be such a force for good in the community, always bursting with positive energy and being interested in what people have to say. Also, she mains a trooper. Do I even need to add anything else? Anyway, as is her style, she celebrated her new subscriber milestone by being generous and holding many giveaways, but also with some events. Yesterday I spotted that one of them was happening just an hour before my usual ops time, an easy time to jump in and have a look! 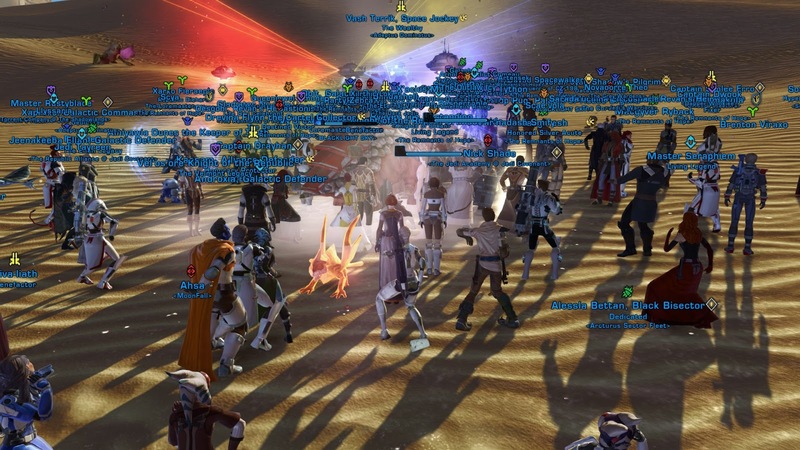 The premise was simple: Meet on Tatooine and do the "no bones" dance together, which Swtorista says is her favourite. Since it's an emote that has to be unlocked, she even hoarded a lot of them to give out for free so people would be able to join the dancing without having to spend any money. Fortunately I didn't require one because I have most of the emotes unlocked account-wide, I just don't always remember to go in and claim them until I actually want to dance and notice that everything is greyed out. And yes, I did have an eligible character on the Star Forge, where the event was being held, because that's where my Cathar Commando from the Ebon Hawk has ended up after the merges. I arrived on Tatooine pretty bang on time and was surprised to be put into instance five of the planet already. I mean, we all know how the game's instancing works on a basic level, but it was kind of surprising how quickly it started spawning new ones. Tatooine 5 hadn't even hit 50 people by the time Tatooine 6 started showing up. People starting to gather in instance 5. 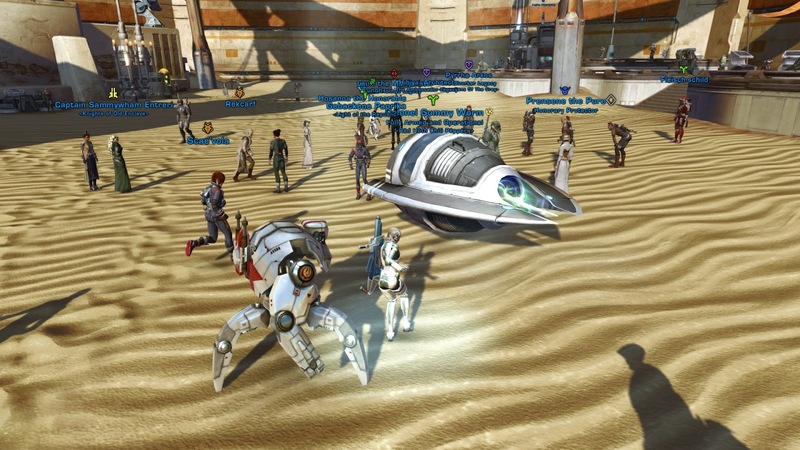 Swtorista herself was in Tatooine 1 of course, which was a bit disappointing for everyone who couldn't make it there. However, at one point she hit on the fact that the game would give some leeway if you were friends with a person in another instance and announced this on chat. I added her to my friends list and bingo! Immediately the game prompted me to transfer to Tatooine 1, despite of it showing as full on the map menu. Unfortunately there still seemed to be a hard cap on how many people it would let into a single instance of the planet, as I never saw Tatooine 1 go above 99, and I don't think everyone in the other instances was just that bad at following instructions. I thought about saying hi, but there were so many people shouting in chat, all wanting to see Swtorista of course, that I decided things were probably overwhelming enough as it were and I was just going to "hang out" and enjoy the event. 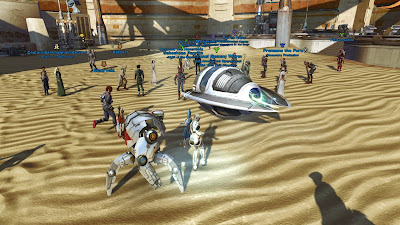 Emotes were handed out all around, though not everyone was happy: Some people discovered too late that completely free-to-play accounts weren't allowed to trade and therefore couldn't receive the emote either way. I think some of the attendees in the other instances also felt a bit abandoned, which I could understand. Obviously Swtorista could only be in one place at a time, but I didn't really understand why she couldn't send some of the "assistants" she had brought into the other instances to hand out emotes there too and provide some direction. Then again, there seemed to be talk happening on voice chat on top of all the shouting in text chat, which I wasn't privy to, so maybe it was explained there. Either way, eventually most people in instance 1 at least were ready to do the dance, so we did! It was just a bit of silliness and didn't last long, but it was still fun to just see so many players coming together out in the world. 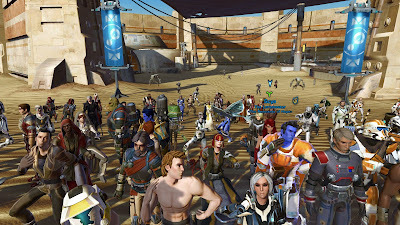 The whole thing really highlighted the limitations of SWTOR's instancing system however - while it makes perfect sense to limit the number of people in one place at any given time to avoid overcrowding in daily areas and such, when you just want to have a social gathering it's not very fun to be forcefully kept apart. I guess Bioware wants us to stick to the fleet, which is intended to be a social space and supports much bigger numbers. In any case, it was a memorable little event (they went on to do some more things afterwards I think, but by then it was time for my guild's ops night), so thanks, Swtorista! Here's to your next ten thousand subscribers. She does a service that would have made my baby steps into MMOs (WoW) a lot easier if I hadn't had a couple of friends to guide me. I'm glad she's around for SWTOR.